Aang is a fictional character in Nickelodeon's animated television series Avatar: The Last Airbender. The character, created by Michael Dante DiMartino and Bryan Konietzko, is voiced by Zach Tyler Eisen. Aang—the show's main protagonist—has appeared in all but one episode of the show, the exception being "Zuko Alone". Aang also appeared in the pilot episode, which has never been aired. Aang has appeared in other media, such as trading cards, video games, T-shirts, and web comics. 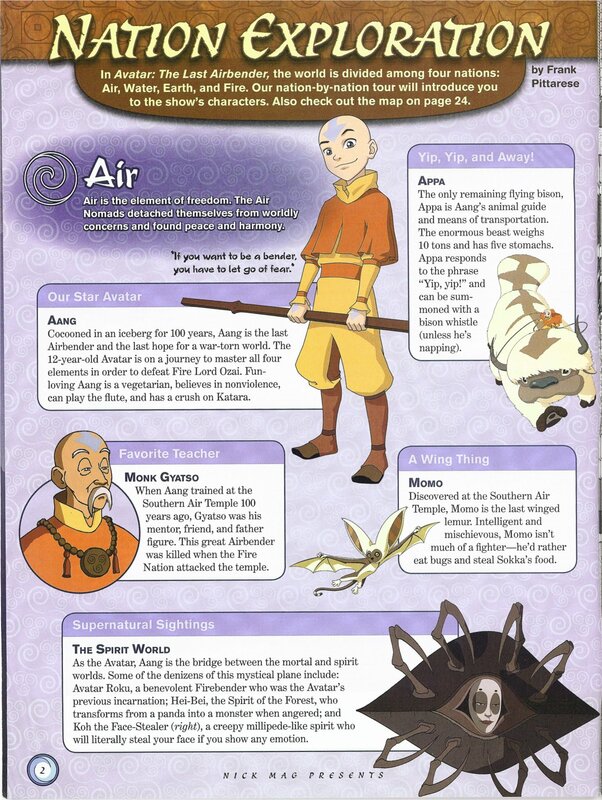 In the show, Aang is the last surviving Airbender and a monk of the Air Nomads, the only race of people with the unique ability to manipulate the air around them. He is also a supercentenarian at the age of 112. He was in suspended animation for one century, making his biological age twelve. It is revealed in the second episode that he is the current incarnation of the Avatar, the spirit of the planet manifested in human form. As the Avatar, Aang controls the elements and is tasked with keeping the Four Nations at peace. The show follows Aang's journeys to complete this task. Most of Aang's traits, such as vegetarianism, are based on Buddhist and Taoist tradition. Aang is the series' reluctant hero, showing hesitation when joining his friends to save the world from the Fire Nation. His "lighthearted" personality has been accepted well among critics. The creators intended Aang to "defeat enemies with his wits" and be a "trickster hero". The plot they described corresponds with the first and second episodes of the series, where the "water people" (Katara and Sokka) rescue the "air guy" (Aang) while "trapped in a snowy wasteland" (the Southern Water Tribe) with "some fire people [that] are pressing down on them" (Fire Nation Troops and Zuko). The creators of the show intended Aang to be trapped in an iceberg for one thousand years. He was to wake inside a futuristic world, where he would have a pet robot named Momo and a dozen flying bison. The creators lost interest in the theme, and changed it to one hundred years of suspended animation. The robotic Momo was changed to a flying lemur, and the herd of bison was reduced to one. Aang's character has a well developed cultural ideology. According to the show's creators, "Buddhism and Taoism have been huge inspirations behind the idea for Avatar." A notable aspect of the character is his vegetarian diet, consistent with Buddhism or Taoism. In the Brahmajala Sutra, a Buddhist code of ethics, vegetarianism is encouraged. In "The King of Omashu", Aang demonstrates his vegetarian beliefs by refusing to eat meat. Aang consistently shows a reluctance to fight and an aversion against killing. In "The Spirit World (Winter Solstice, Part 1)", Aang gets into a fight with an angry spirit who is destroying a village; instead of fighting the spirit, Aang negotiates. In Buddhism, this principle is known by its Sanskrit name, ahimsa, or non violence. Airbending, the style Aang primarily uses in the show, is based on an "internal" Chinese martial art called Baguazhang. This fighting style focuses on circular movements, and does not have many finishing moves. These characteristics were meant to represent the unpredictability of air and the peaceful nature of Airbenders in the show. The producers of the show have named each season as a "book"; each of these books was named after one of the four elements in the show. Flashbacks also reveal events that happened before the show opened. In a flashback during "The Storm", the elder monks hold a private meeting with Aang to reveal his identity as the Avatar. Monk Gyatso, Aang's mentor and father-figure, insists that Aang be raised as a regular child. Nearing the end, the monks began to believe that Gyatso interfered too much, so they decide to send Aang to the Eastern Air Temple. 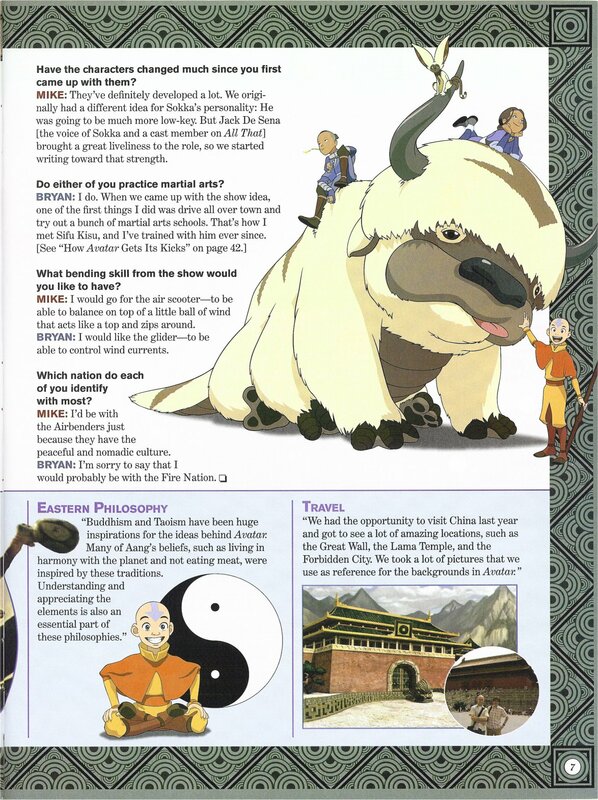 Aang refuses to be torn away from his mentor; he writes a note for Gyatso before flying away on his bison. It is revealed in the first episodes of the show that a violent storm catches Aang and plummets him into the ocean during his escape. Aang then enters the Avatar State, unknowingly, for the first time to encase himself and Appa in a frozen air bubble. An image of this air bubble, resembling an iceberg, ends the flashback. After 100 years in the frozen iceberg, the show opens when Katara and her brother Sokka free Aang and Appa in the first episode of the show. In the next episode, they all set off for the Northern Water Tribe, with intentions to find a waterbending master to teach Aang and Katara. Throughout their journey they are chased by Zuko, the banished prince of the fire nation, with whom they have many encounters. In another episode, Aang meets his previous incarnation, Avatar Roku, informing him that he must master all four bending arts and defeat Fire Lord Ozai before the end of summer. Later, in the second season, Aang meets Toph Bei Fong, a blind earthbending master, who becomes one of his teachers. A couple of episodes later, Aang and his friends find out that a solar eclipse will occur before the end of the summer, rendering the Firebenders powerless. During the season finale, Aang battles in the underground caverns of Ba Sing Se. He is nearly killed when Azula strikes him with lightning, but survives thanks to Katara's healing abilities. In the third season, Aang and his comrades gain a new enemy while traveling – an assassin hired by Zuko who firebends with his third eye. Aang and his remaining allies attack the Fire Nation capital in the tenth and eleventh episodes of the season, but are thwarted by Azula. In the following episode, Zuko has a change of heart and offers to teach Aang firebending. Aang accepts, despite the group's strong opposition. In "The Firebending Masters" Aang learns firebending with the help of the last two dragons. During the two hour series finale, he struggles with the question of whether or not to kill the Fire Lord. After he sleepwalks into a forest, he speaks to four previous Avatars, seeking advice. Each gives him a reason to kill the Fire Lord, discouraging him. After discovering that the forest is atop a swimming lion-turtle, and receiving advice from said lion-turtle, he prepares to confront the Fire Lord. Once Ozai arrives, Aang engages him in battle. After sparing Ozai when redirecting his lightning and then being backed into a corner, Aang releases his seventh chakra and enters the Avatar State. The Avatar State tips the battle in Aang's favor, and makes swift work of Ozai. Using a technique taught to him by the lion-turtle, Aang removes Ozai's ability to firebend, effectively eliminating the threat. Later, in the Fire Nation capital, Aang is seen in monk robes, standing beside Zuko while Zuko is appointed Fire Lord. He is later seen relaxing with his friends in Ba Sing Se. The series ends with Aang and Katara kissing. The Avatars (from right to left): Aang, Roku, Kyoshi, Kuruk, Yangchen, and other previous Avatars. We wanted Aang to solve problems and defeat enemies with his wits as well as his powerful abilities. Aang is a vegetarian, as shown in "The King of Omashu" and "The Headband" when he refuses to eat meat since the Air Nomads taught him that all life is sacred. Aang states a reluctance to fight in "The Spirit World (Winter Solstice, Part 1)"; Aang hopelessly negotiates with a spirit who is destroying a village instead of fighting. Due to his non-violent nature, he also shows ethical reluctance in killing Firelord Ozai, and eventually strips Ozai of his bending instead of killing him. In the show, Aang has a complex network of friends extending over all four nations. Aang reveals in "The Storm" that he wishes he had been there to help his people a century ago, but would rather live a child's carefree life. Multiple times in the show, Aang demonstrates how much he cares for those close to him and also demonstrates his fun-loving nature. He also showed that he can act immaturely, and once tried to deceive others in order to keep the group together. In "Bato of the Water Tribe", Aang thinks Katara and Sokka might leave to visit their father. Aang hides the map showing their father's whereabouts and lies about having it in the first place. In some episodes, he demonstrates flight abilities with airbending. One technique for this is to make a ball of air and ride on it, which Aang calls the Air Scooter. Other methods of flying include his glider, and Appa. In the Avatar State, Aang can also fly in a ball of air. In the show's intended demographics, Aang has been received exceptionally well. Kendall Lyons stated, "Aang seems to be the lighthearted kid that you can easily familiarize yourself with", and that he "seems to bring comfort in the most dangerous or hostile situations." There are many similar descriptions about Aang as a child-like character who is "reckless and excitable". Reviews point out that "as the Avatar, Aang seems unstoppable, but as Aang, he is just another Airbender"; the review states later that the show continues to focus on a more realistic character instead of a perfect one by revealing many character flaws. Noah Ringer as Aang in the M. Night Shyamalan's The Last Airbender. Aang's character appeared in the Avatar: The Last Airbender Trading Card Game on a multitude of cards. He appeared in the Avatar: The Last Airbender video game as one of the four playable characters. Two sequels were made: Avatar: The Last Airbender - The Burning Earth, followed by Avatar: The Last Airbender – Into the Inferno. Avatar T-shirts, some with Aang appearing on them, are being sold through the Nickelodeon Shop website. Tokyopop has published a films comic (sometimes referred to as cine-manga), which Aang, being the main character of the show, appears in repeatedly. Aang appeared in Escape from the Spirit World, an online video game that can be found on Nickelodeon's official website. The game includes certain plot changes that are not shown in the show. 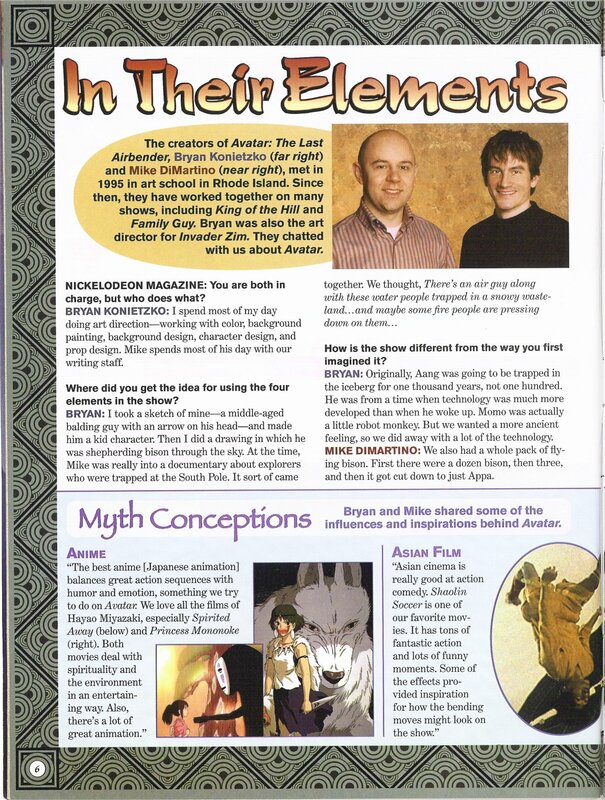 The show's directors, Michael DiMartino and Bryan Konietzko, claim the events are part of canon. This means that even though the events occurred in a separate media, they still are considered part of the storyline. According to Entertainment Weekly, after "an open casting call in Texas, M. Night Shyamalan discovered Tae Kwon Do star Noah Ringer and offered him the part of Airbender’s 12-year-old hero, Aang, an avatar with super-powers who must stop the Fire Nation from destroying the world." ^ Written and Directed by: Michael Dante DiMartino, Bryan Konietzko; Voices: Mitchel Musso as Aang and Mae Whitman as Kya. (2006-09-19). Avatar: The Last Airbender — The Complete Book One Box Set. [DVD]. Nickelodeon. ^ a b "Avatar Trading Card Game". Nickelodeon. http://entertainment.upperdeck.com/avatar/en/interface.aspx. Retrieved 2008-03-24. ^ a b "Avatar: The Last Airbender Trading Card Game". BoardGameGeek. http://www.boardgamegeek.com/game/22469. Retrieved 2008-03-24. ^ a b "Avatar: The Last Airbender — The Burning Earth" (Flash). Nickelodeon. http://www.avatartheburningearth.com/. Retrieved 2008-03-13. ^ a b "Avatar Escape From The Spirit World" (Adobe Flash File). Viacom Corporation. http://www.nick.com/avatarescape/index.jhtml. Retrieved 2008-02-19. ^ a b "The Nickelodeon Shop — Avatar". Nickelodeon. http://shop.nickjr.com/category/index.jsp?categoryId=2060004. Retrieved 2008-02-11. ^ a b created by Michael Dante DiMartino & Bryan Konietzko. (2006). Avatar: The Last Airbender Cine-Manga Volume 1. Avatar: The Last Airbender Cine-Manga. Tokyopop. ISBN 1595328912. http://www.tokyopop.com/product/1423. Retrieved 2008-03-14. ^ a b c d e f g h "The Boy in the Iceberg". Director: Dave Filoni, Writers: Michael Dante DiMartino, Bryan Konietzko. Avatar: The Last Airbender. Nickelodeon. 2005-02-21. No. 1, season 1. ^ a b Pittarese, Frank (2006). "Nation Exploration". Nickelodeon Magazine (Winter 2006): 2. ^ a b c "The Avatar Returns". Director: Dave Filoni, Writers: Michael Dante DiMartino, Bryan Konietzko. Avatar: The Last Airbender. Nickelodeon. 2005-02-21. No. 2, season 1. ^ a b c "Watch Out For Avatar on September 10!". Nickelodeon Asia. http://www.nicksplat.com/Events/200509/07000082.html. Retrieved 2008-03-14. ^ a b c "The King of Omashu". Director: Anthony Lioi; Writer: John O'Bryan. Avatar: The Last Airbender. Nickelodeon. 2005-03-18. No. 5, season 1. ^ a b c DiMartino, Michael Dante; Konietzko, Bryan (2006). "Myth Conceptions". Nickelodeon Magazine (Nickelodeon) (Winter 2006): 7. ^ a b Lyons, Kendall (2005-12-08). "Avatar: The Last Airbender". Animation Inside. pp. 2. http://www.animationinsider.net/article.php?articleID=613. Retrieved 2008-02-15. "Aang seems to be the lighthearted kid that you can easily familiarize yourself with. He seems to bring comfort in the most dangerous or hostile situations." ^ a b DiMartino, Michael Dante & Bryan Konietzko. Interview with Eduardo Vasconcellos. Interview: Avatar's Bryan Konietzko and Michael Dante DiMartino. IGN Entertainment. 2007-09-06. Retrieved on 2007-11-11. ^ a b c d DiMartino, Michael Dante; Konietzko, Bryan (2006). "In Their Elements". Nickelodeon Magazine (Winter 2006): 6. ^ Jing, Fanwang. "Brahmajala Sutra Translated Text". Purify Out Mind. pp. 4. http://www.purifymind.com/BrahmaNetSutra.htm. Retrieved 2008-02-12. "He must not create the causes ... and shall not intentionally kill any living creature." ^ a b "The Spirit World (Winter Solstice, Part 1)". Director: Lauren MacMullan; Writer: Aaron Ehasz. Avatar: The Last Airbender. Nickelodeon. 2005-04-08. No. 7, season 1. ^ "Nickelodeon's Official Avatar: The Last Airbender Flash Site". Nick.com. http://www.nick.com/all_nick/tv_supersites/avatar2/. Retrieved 2006-12-02. ^ a b "The Storm". Director: Lauren MacMullan; Writer: Aaron Ehasz. Avatar: The Last Airbender. Nickelodeon. 2005-06-03. No. 12, season 1. ^ a b "The Southern Air Temple". Director: Lauren MacMullan, Writer: Michael Dante DiMartino. Avatar: The Last Airbender. Nickelodeon. 2005-02-25. No. 3, season 1. ^ "Avatar Roku (Winter Solstice, Part 2)". Director: Giancarlo Volpe, Writer: Michael Dante DiMartino. Avatar: The Last Airbender. Nickelodeon. 2005-04-15. No. 8, season 1. ^ "The Blind Bandit". Director: Ethan Spaulding; Writer: Michael Dante DiMartino. Avatar: The Last Airbender. Nickelodeon. 2006-05-05. No. 6, season 2. ^ "The Library". Director: Giancarlo Volpe; Writer: John O'Bryan. Avatar: The Last Airbender. Nickelodeon. 2006-06-14. No. 10, season 2. ^ "The Crossroads of Destiny". Director: Michael Dante DiMartino; Writer: Aaron Ehasz. Avatar: The Last Airbender. Nickelodeon. 2006-12-01. No. 20, season 2. ^ "The Avatar and the Firelord". Director: Ethan Spaulding; Writer: Elizabeth Welch Ehasz. Avatar: The Last Airbender. Nickelodeon. 2007-10-24. No. 6, season 3. ^ "The Day of Black Sun Part 1: The Invasion". Director: Giancarlo Volpe; Writer: Michael Dante DiMartino. Avatar: The Last Airbender. Nickelodeon. 2007-11-23. No. 10, season 3. ^ "The Western Air Temple". Director: Ethan Spaulding; Writers: Elizabeth Welch Ehasz, Tim Hedrick. Avatar: The Last Airbender. Nickelodeon. 2007-12-14. No. 12, season 3. ^ a b c "Sozin's Comet". Director: Ethan Spaulding; Writers: Elizabeth Welch Ehasz, Michael Dante DiMartino, Bryan Konietzko. Avatar: The Last Airbender. Nickelodeon. 2008-07-19. No. 58-61, season 3. ^ "Sozin's Comet: The Avatar's Story Ends - Animation - Page 2 | CRAVEONLINE.COM". Craveonline.com. http://www.craveonline.com/articles/filmtv/04651115/2/sozins_comet_the_avatars_story_ends.html. Retrieved 2008-12-24. ^ "The Headband". Director: Joaquim dos Santos; Writer: John O'Bryan. Avatar: The Last Airbender. Nickelodeon. 2007-09-28. No. 2, season 3. ^ Liu, Ed (2008-07-18). ""Sozin's Comet" Produces an Epic Season Finale for "Avatar the Last Airbender"". Toon Zone. http://news.toonzone.net/article.php?ID=25009. Retrieved 2008-07-20. ^ "Bato of the Water Tribe". Director: Giancarlo Volpe; Writer: Ian Wilcox. Avatar: The Last Airbender. Nickelodeon. 2005-10-07. No. 15, season 1. ^ "The Drill". Director: Giancarlo Volpe; Writers: Michael Dante DiMartino, Bryan Konietzko. Avatar: The Last Airbender. Nickelodeon. 2006-09-15. No. 13, season 2. ^ "The Swamp". Director: Giancarlo Volpe; Writer: Tim Hedrick. Avatar: The Last Airbender. Nickelodeon. 2006-04-14. No. 4, season 2. ^ "Sozin's Comet, Part 4: Avatar Aang". Director: Joaquim dos Santos; Writer: Michael Dante DiMartino, Bryan Konietzko. Avatar: The Last Airbender. Nickelodeon. 2008-07-19. No. 21, season 3. Transcript. ^ Robinson, Tasha (2006-03-07). "Avatar: The Last Airbender". Sci-Fi Weekly. pp. 2. http://www.scifi.com/sfw/anime/sfw12366.html. Retrieved 2008-02-15. "Aang, meanwhile, is as reckless and excitable as a kid his age should be, but he also shows the marks of a monastic life of training and responsibility." ^ Mell, Tory Ireland (2008-02-27). "Avatar: The Last Airbender - "The Spirit World (Winter Solstice, Part 1)" Review". IGN Entertainment. http://tv.ign.com/articles/855/855270p1.html. Retrieved 2008-03-11. "As the Avatar, Aang seems unstoppable, but as Aang, he is just another Airbender..."
^ "Avatar: The Last Airbender Video Game". Nick.com. Nickelodeon. http://www.nick.com/games/nick_video_games/avatar/lastAirBender/. Retrieved 2008-03-22. ^ "IGN.com: Avatar: The Burning Earth". IGN. http://wii.ign.com/objects/905/905219.html. Retrieved 2008-03-13. ^ Nicole Sperling, "Movies," Entertainment Weekly 1026 (December 17, 2008): 15.
title= - Toon Zone - Your Source for Toon News!